Bongaigaon, May 24: On Wednesday evening, police nabbed two drug peddlers along with 109 kg ganja. Talking to media persons, Rustam Brahma, OC, Manikpur Police Station of Bongaigaon district, said that the police on duty on NH-31 near Gerukabari Police outpost under Manikpur Police Station noticed a car. “Two boys were trying to start a Maruti SX car (WB 02Y 2107). The police became suspicious and searched the car. They recovered a hidden chamber in the dicky of the car. 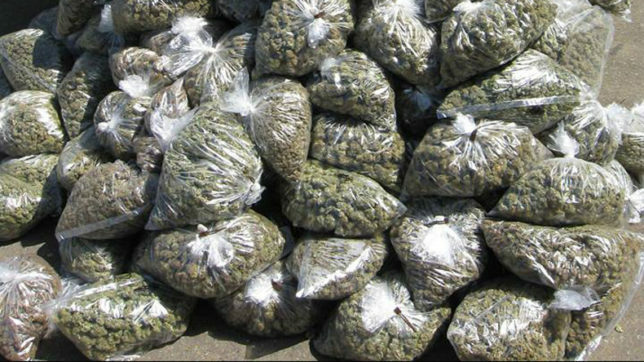 From the chamber, total 109 kg ganja was recovered. The youths have been identified as Ranjit Ray (22) and Sunil Kumar (22), both resident of Purba Durjhangarh of West Tripura district in Tripura. They had got the car from someone whom they do not know, at Patharkandi in Hailakandi. They said that they had to deliver the car to someone else at Purniya in Bihar,” Brahma said. “The whole trade is run by a mastermind and these youths just follow instructions. They even do not know for whom they are working. They were given the mobile number of the man they had to hand over the vehicle to. This is a phase-by-phase transporting process where several teams are used. This process keeps the mastermind out of police reach,” he added. “But police are trying their level best and we hope to nab the main culprit soon,” the OC said.